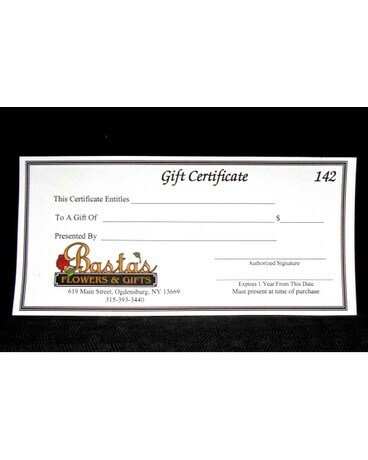 Basta's offers gift certificates in any dollar amount all year long. We have 6 greenhouses full of beautiful bedding plants in the spring, gift items such as Yankee Candle, Willow Figurines, Stonewall Kitchen, jewelry and much more in the shop as well as fresh flower arrangements. May be purchased in any increment that fits your budget!